This is the first time I've opened my computer in something like four days. 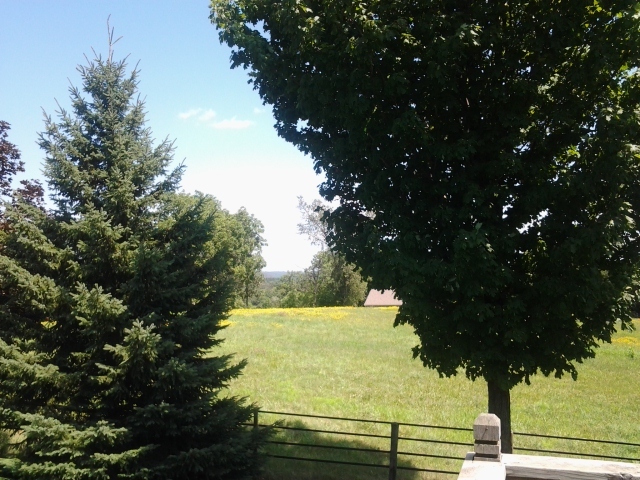 I wrapped up my house-sitting stint on Saturday and things have been relatively non-stop since then. 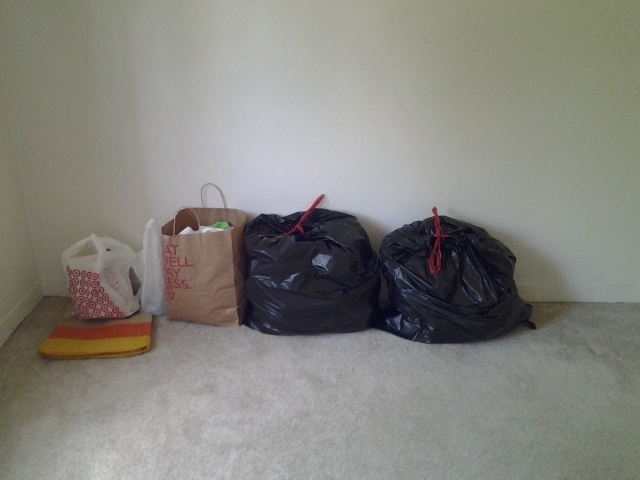 I don't know if I've mentioned it yet but I moved out of my apartment. Yes, I am back in small town America. Or at least my things are. Moving is probably top on my list of Activities I Hate. If there is a silver lining to it, it's that it gives you the opportunity to get rid of the crap that you don't use any more. I put on my bravest, non-sentimental face and purged my heart out. Below is what ended up in the Donate pile. (There was even more in the Toss pile.) Happily, this helps me out with one of my 2012 goals. Winning! After moving all my things out and spending some quality time with some very harsh chemicals cleaning my apartment, I was ready to relocate to the Valley of the Jolly Green Giant. My parents have a second house we call the Ministry House which is generally reserved for people that are either a) speaking at one of the conferences or b) in need a place to stay for a while. I have taken over the walkout basement which also has a full bathroom so it's kind of like a studio apartment, minus a kitchen. I will have "roommates" in the upper level any time we have a conference (which is usually once a month) or out-of-town guests. Here's where things get exciting: For the past two days, I had been having some of the same symptoms I had when I had my PE (pain in my rib, shortness of breath, etc.). Being stubborn and busy, I didn't want to immediately head to the hospital and just attributed it to stress and activity. 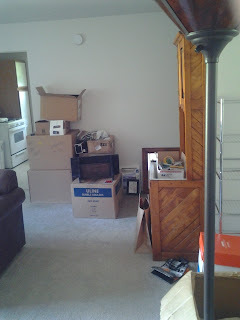 However, during the move-in process yesterday, the shortness of breath part got to the point where I was having to stop what I was doing to try to get a deep breath. After a talk with my mom, a call to my doctor, and some quick family prayer time, I found myself in the ER . 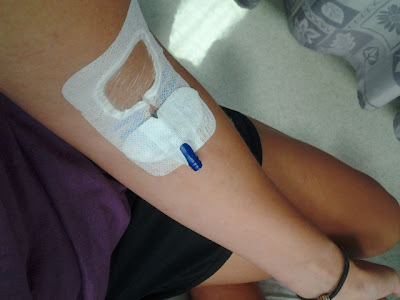 Because of my history, an IV was placed and I headed in for a CT scan before blood tests even came back. And then we waited. Results: All clear! After 2.5 hours there, I was released. The only major excitement was when they removed my IV and blood literally spurted everywhere. I quickly applied pressure to it while the nurse grabbed some towels but not before both of my hands, arm, and shirt got sprayed. (I thought about having my mom take a picture but it was a little gory.) 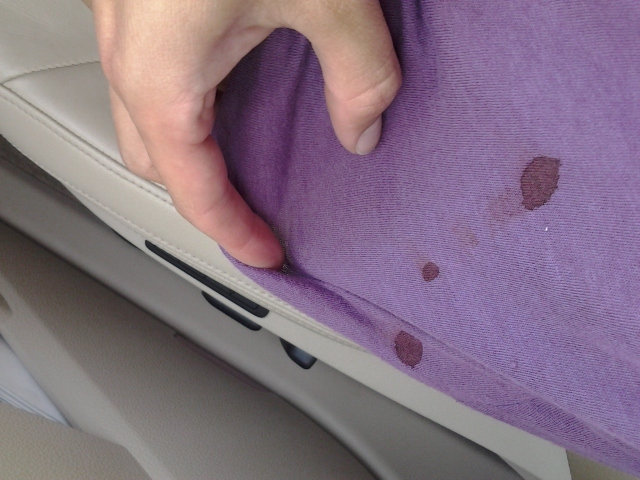 I did document the blood spatter on my shirt when we got into the car, though. Also: I haven't had any of the symptoms since I went in. Amen.